Whenever I get the chance, I try to look for hidden gems in the burbs of Vancouver. After all, the majority of the population live outside of Vancouver itself. Thus, there must be good eats out there. Being quite last minute, we took the kiddies to the Laity Pumpkin Patch out in Maple Ridge on Halloween. After all that rain, the patch resembled a swamp more than anything else. I really don't like mud. When I used to mountain bike, I would hate wiping out. Not because it hurt; rather, I'd get all muddy. Yes, call me a wuss. Since we were out near 200th already, I thought we should take another jaunt over the Golden Ears Bridge into Langley. Why Langley? 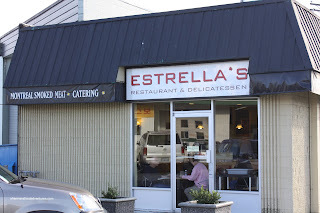 Well, there is this little place called Estrella's Montreal Deli. 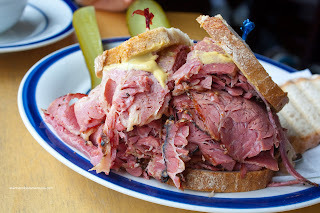 Have you ever noticed that there are very few places that you can get real deli sandwiches? You know, the big honking ones you get in NYC or Montreal? And don't even put Kaplan's in that category. Their sandwiches are so small, you'd think they were vegetarian. 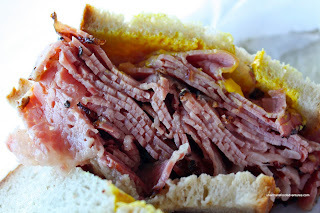 Well, if you crave those sandwiches you'd find back east, Estrella's is the place to be. They smoke their own meats and it shows with the final product. There are full slabs of smoked meat in the display case along with other items on the menu including Paninis; but I came here for the smoked meat sandwich. You can choose from several sizes: Petite, Classic, Large (The Montreal) and Extra large (Oh Canada!). I wasn't in the mood for a $17.99 sandwich, so I went with the Montreal for $12.49. 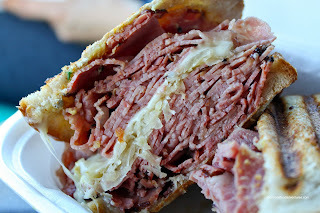 For a little variety, I made Viv's into a Reuben adding $2.98 for sauerkraut and cheese, grilled on a press. goodness. 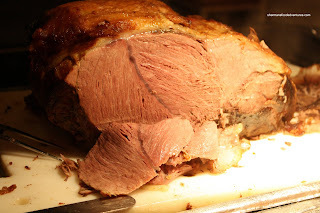 You can choose how you like your meat: extra lean, lean, or medium We went for medium naturally! The Smoked Meat Sandwich (non-Reuben) was predictably just as good; but rather than crispy grilled bread, it was soft light rye. Eating this sandwich was like eating butter. It was soft, and literally melted in our mouths. This was indeed a pleasant surprise. I've had deli sandwiches in NYC and the ones here at Estrella's are not that far off. I would definitely drive out to Langley for more of these delicious sandwiches and I think you should too. And yup, I drove out again, with closet meat-lover Mijune. Well, I actually sor ta kidnapped her and took her out to almost out of Langley to Hilltop Cafe Diner for their Everest Burger. After that, I gave her more meat... uh... at Estrella's. This time, I had no doubts in my mind and suggested we share the Oh Canada! 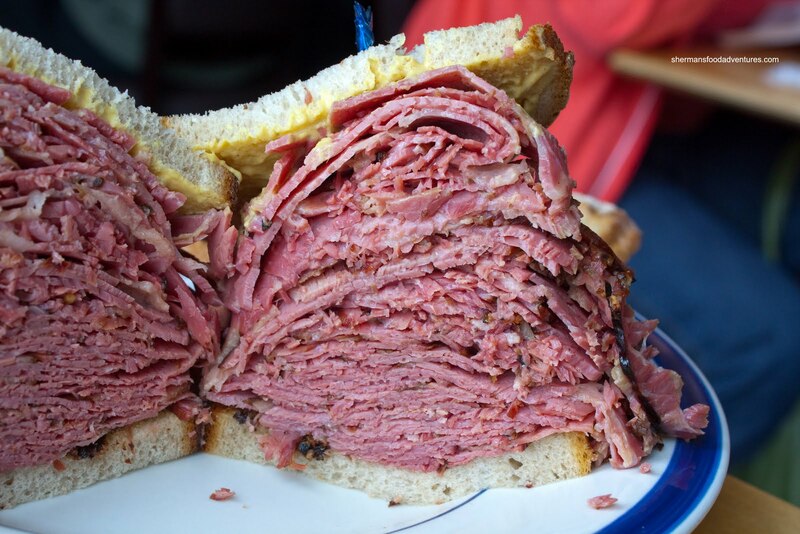 It's a pound of delicious moist and tender Montreal smoked meat. It has just the right amount of seasoning where it doesn't taste salty at all. We went for half medium and half lean. Take it from me, go for the medium, there is no other way to eat it. 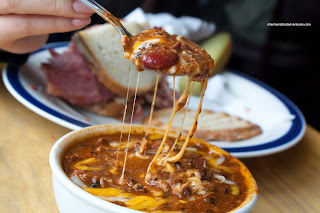 For a bonus, we also got an order of their Smoked Meat Chili and it was friggin' fantastic! They used the same spices from the smoked meat (or it was just the spices from the smoked meat) and it gave the chili a unique flavour from the peppercorns, cloves, all-spice and so on. It had an underlying heat and a nice tang/sweetness. Loved the melted cheese too. Sitting beside us were a couple from Montreal and they confirmed this is the place to go in the GVRD for smoked meat. The owner is from New York and went to Montreal to learn how to make it. It shows and I think everyone should make the trek out to give it a try! Bin 941 has been on my "to blog about list" for quite awhile; but somehow it kinda got lost in the shuffle. It wasn't until Ben (Chowtimes) blogged about it that reminded me about it. Tonight, it was the perfect destination because it was our usual Friday night hockey and it was going to end late. Since Bin 941 closes at 2:00am, we had a place to do our late night eats. Wait, isn't there like an endless lineup at this place on a Friday night??? Remember when I said it was the perfect destination for tonight? My thought was that it would be dead because everyone would be preoccupied with their Halloween parties. Bear was a bit skeptical of this plan; but he played along and everyone agreed to take a chance. To my relief, I was right! Otherwise, I'm sure no one would really want to listen to my "plans" anymore. So what exactly is Bin 941? 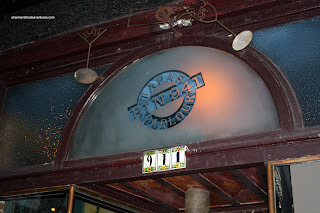 It's essentially a tapas bar where you can hang, have some drinks and munch on tasty food. Don't confuse this with a traditional Spanish tapas joint though. You won't find Paella or the sort here. Rather, Chef Gord Martin has created a menu which is both sophisticated; yet accessible. Of course, being a tapas bar, everything is meant to be shared amongst the people at your table. However, Dr. 911 decided that he was going to be Dr. No-Share and eat his own dish. Was he afraid of H1N1? Whatever the case, we gave him a hard time about it. The rest of us (Lionel Hutz, Milhouse and Bear) decided to share 6 items with the first being the Pomme Frites. 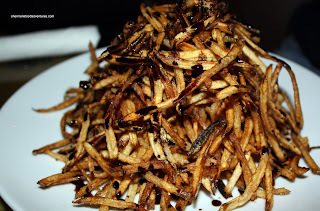 Unlike the usual frites we might associate with, the ones here are of the shoestring variety and drizzled with a balsamic reduction. Definitely different and absolutely delicious. Being that I recently had some fry bread at Beaver Tails, I suggest we try the Navajo bread (which is another variation). 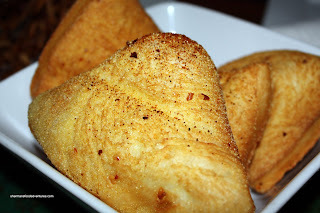 Hot, fluffy and lightly sprinkled with salt and pepper, these little pockets gave out a small puff of hot steam when bitten into. There was actually 2 orders of the Flank Steak; but guess who had one and didn't share? Yup, Dr. No-Share! I'm afraid to think what would happen if we took him to Dim Sum. I can see him munching on 3 orders of Haw Gow to himself (reminds me of an old Sam Hui Cantonese song, "Tsim Sha Tsui Susie"). 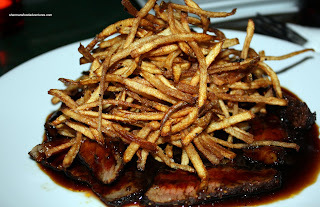 Topped with the same excellent frites, the slices of perfectly cooked and tender flank steak were sauced with maple syrup chipotle glaze. One bite and it was sweet; but then you got hits of cinnamon and chili from the spice rub. Continuing on the beef theme, the Beef Tenderloin arrived next. 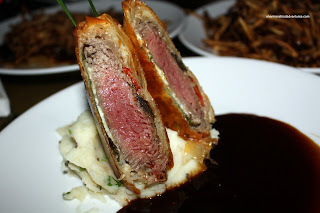 Majestically present, these babies were done Wellington style resting on a bed of delicious mash potatoes. The beef was melt-in-your-mouth tender; however, the sauce was not as flavourful as it looked. I'm not sure if it was just me; but it was more sweet than savory. Dr. No-Share decided to chime in on this dish and remarked how difficult it was to cut the 2 pieces so we could share. Anything to justify himself! 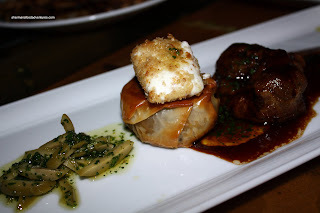 He continued to make his point when we received our next dish - Lamb Sirloin with a mini spanakopita topped with feta and marinated olive slivers. He was laughing at us as we were attempting to cut everything into 4 equal portions. Honestly, he does have a point. If these were meant to share, they were not exactly share-friendly. Anyways, the lamb was ever-so-tender and the sauce was rich. The last dish was probably the easiest to share. We got the Mussels done in a Chirizo Smoked Tomato Broth. The hotpot which it arrived in was filled to the brim with fat, juicy mussels. We were supplied grilled focaccia to soak up the broth. 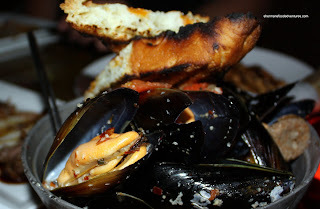 I personally loved the mussels and the fragrant broth; however, Lionel Hutz commented that the broth did not hold up to the mussels very well. He thought the dish was a bit fishy. After eating it a bit more, I would tend to agree that the classic garlic white wine broth would've been much more successful. Overall, the food was pretty darn good. 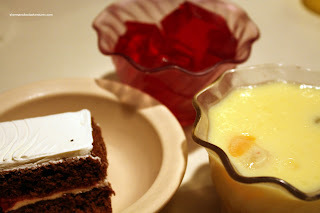 Everything was made with care and consisted of top-notch ingredients. If you take into account the venue and the time of day; it's pretty impressive to get food of this quality. Furthermore, unlike Abigail's Party, the staff were plentiful and seemed interested in providing consistent service. There's a certain charm with eating outside at a food stand. For example, people flock to places such as Pajo's and Japadog (however, there is an actual store opening up). Is it because there is a novelty factor involved? Possibly, but the food needs to deliver as well. Today, I wanted something quick and I was bouncing ideas off Vandelay. One of his suggestions was Go Fish out near Granville Island. Technically, it really isn't all that fast despite being a food stand. The reason is that it's so popular, lineups have been know to exceed an hour. As you know, I hate lineups. However, it's not really all that warm now and it's raining Vancouver-style. With that in mind, I suspected that there would not be the usual lineup. When I arrived, not only did I score a parking space, there were only 3 people in line! Furthermore, there was a break in the rain. This was the perfect situation for many reasons. The most important? Lighting for pictures! You see, overcast weather that isn't too dark is the perfect lighting for pictures! With that in mind, I scoped out a nice table in the corner. I ended up ordering a Grilled Albacore Tuna Sandwich for Viv. She wasn't with me, but for picture purposes, I took a picture of it before I got it packed up. She absolutely loved the sandwich. Fresh and perfectly grilled (still a bit rare), the tuna was dressed in sweet chili ponzu glaze, salsa and wasabi mayo. The result was predominantly sweet flavours with slight undertones of heat from the wasabi. For myself, I had to try the Halibut and Chips. I gotta say that these were very good. The halibut was fresh and the batter was not too thick and crispy. If you look at the picture, you can see that there is barely any batter surrounding the big piece of fish. I particularly liked the tartar sauce since it had a nice sweetness to it, partly due to the addition of dill. Unlike quite a few run-of-the-mill tartar sauces, this one had a nice zing to it. It was also perfect to dip the really crispy fries (or pomme frites as they say). Usually the coleslaw is almost an afterthought, much like red lights in Richmond. However, this coleslaw was quite different. There was no creamy mayo dressing on this cabbage; rather it was definitely Asian-inspired with the zing of rice wine vinegar and the aromatics of sesame oil. Not traditional in any way; but a welcome change to the regular. For no reason other than to try more items, I also got the Fish Tacone which is a play of a fish taco that is in the shape of a cone. Ingredients were fresh and it works as a light meal or snack. Interesting... This may be merely a shack across from Granville Island; but the eats scream out quality and creativity. I have to give credit to Gord Martin (Bin 941/942) for his interpretation of the outdoor fish n chip stand. Just don't come when the weather is nice, you'll be waiting awhile. When you live in a particular neighbourhood long enough, you begin to discover local favourites. Most of these places are not well known to other people unless by word of mouth. Finally, I decided to try a local Japanese restaurant called Take Sushi. Technically, it's a Chinese-run Japanese restaurant; but I'll reserve judgment until after I try the food. Whatever the case, after the meal I had at Kawawa, there really can't be anything worse. Formally Jun Sushi, Take has quite a simple; yet attractive awning in front. For some reason, I love the simple white-on-black signage. I can never understand the red-on- yellow signage of some Chinese restaurants. Did they ever look at it and consider that it's just plain ugly? I digress. Inside, the place is not very big; but they effectively use the space. We were warmly greeted by the staff and immediately seated. One scan of the menu and I noticed that the prices were quite reasonable, especially the combos. However, we decided to order individual items since the combos came with California Rolls (not really our favourite). We started with an order of Salmon Sashimi. The pieces were pretty dece nt in size and the fish itself was quite fresh. No sliminess, fishy taste or mushiness. In addition to the sashimi, we ordered some Nigiri. I gotta tell you, ordering it was quite comical. It went something like this, "I'd like 2 pcs Inari...". "What? Ina..ri?" "I'd also like 2 pcs Unagi". "Un... what?" "Unagi". "Okay, 2 pcs of Toro". "Uh, can I check the menu?" "Alright, finally I'd like one piece of Uni". "???". "The special, behind you on the menu board"! That was a bit painful. You know you're not dealing with Japanese staff when I know Japanese better than the server. The Nigiri was pretty good with well-prepared sushi rice and fresh toppings. I liked the Uni; but Viv really didn't care for it. She said the aftertaste resembled garbage. I never knew she ate garbage before... If I had known, our dates would've been a whole lot cheaper! We also got a Chopped Scallop Roll and a Spicy Salmon Roll. Thankfully, this was ordered in English and the server didn't have any trouble with that. The rolls stayed in one piece and there was a minimal amount of rice on the outside. However, the spicy salmon should've been called the sweet salmon since the sauce was quite sweet. As per usual, we got an udon for the kiddies. We decided on the Nabeyaki Udon. It was a pretty solid bowl of noodles with plenty of ingredients. However, I thought the soup was a bit sweet and lacking depth. But other than that, the meal was quite pleasant and the prices were reasonable. Despite the ordering difficulties, the service was very friendly and attentive. 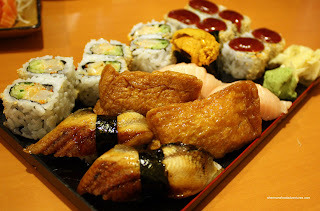 It's not great Japanese food; but it's decent for Burnaby North. - Some staff don't know the menu or Japanese food??? If Pho Tam wasn't packed, I would've tried it out. I don't know about you, but I hate lineups and I also hate circling for parking. This time, I was lucky that the place wasn't too busy and there plenty of parking. With my choice of any seat in the house, I went for the one near the window and in a corner. That way, they really can't see what I'm doing. Without even looking at the menu, there were a few specials that caught my eye. Special A was any choice of a large Pho with spring roll for $8.95 and Special B was any choice of a large Pho with salad roll for $9.25. I decided to go with the latter. Before I even got to eat the Shrimp Salad Roll, I was already impressed. Big, fresh-looking shrimp halves resided under the thin rice wrapper. One dip into the thick peanut sauce and crunch! The roll was fresh with crunchy lettuce and sprouts surrounding the rice noodles. I know it is only a salad roll; but this one was good. If you know me by now, there is only one Pho I would choose - the one with the most stuff! I got the Phở Dặc Biệt which consists of well done beef, brisket, tendon and tripe. It is one of the biggest bowls of Pho I've had in the GVRD. The bowl was filled with rice noodles and topped with so much meat, I couldn't see the noodles! One sip of the broth, which was on the sweeter side, yielded a very beefy flavour. The noodles were just right and the meats were tender. For the price I paid, this was a bargain. On a subsequent visit, I decided to go for the Special A which started with a Spring Roll. Unlike so many "Vietnamese" restaurants in the GVRD, they do not use wheat wrappers here. It totally baffles me why they don't use rice wrappers. It's not like rice wrappers are hard to find! I certainly hope it's not due to people who merely want wheat wrappers which force restaurants to do so. Anyways, I liked the spring roll. It was crunchy and packed full of flavourful pork, veggies and vermicelli. 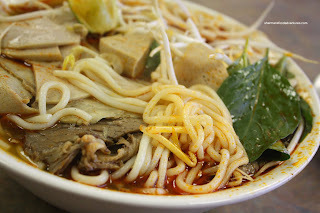 Going for something a bit different, I went for a large bowl of Bún Bò Huế. Once again, there was so much in the way of meat, I swear there was more than the amount of noodles. The combination of pork, Vietnamese ham, brisket and meatballs was awesome; but a chore to eat since there was so much of it. I liked the broth here, it was spicy while not overwhelming the rest of the ingredients. As always, the rice noodles are slippery suckers, they were not overcooked though. 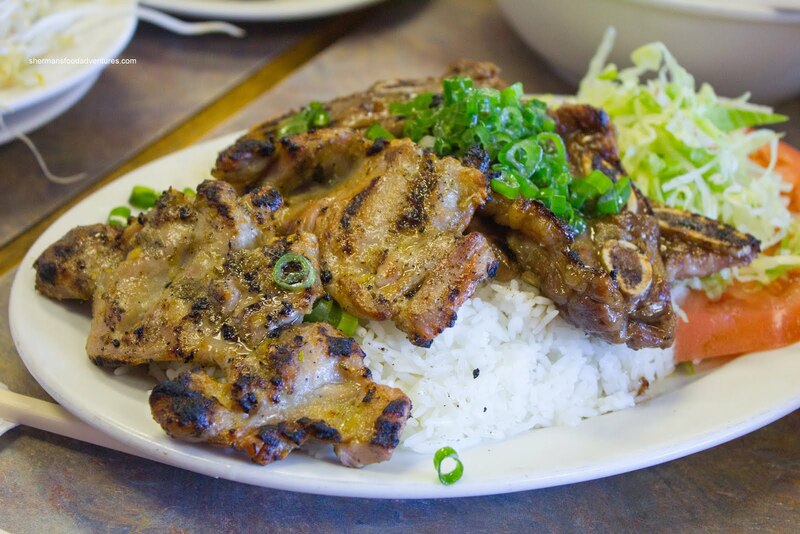 I just can't get enough of this place and to prove it, I went back again with some friends and had the Grilled Shortribs on Rice. Much like all their other dishes, this was huge. Lots of tender, meaty ribs over chewy rice. There was a good char which helped heighten the flavours. I was really stuff after this. It's too bad that I don't live closer, I'd come here every week. Probably the best all around bowls of Pho I've had in awhile. I just have to remember to not circle the block more than a few times. Otherwise, the police will come after me. Some of you might be wondering why the heck did I eat at Uncle Willy's. In fact, I'm sure some people didn't realize it was still in business. Well, there is only one location left and it's definitely changed hands. I think it's now run by a Korean family. Whatever the case, the reason we actually came here was that my son had just finished his floor hockey session at Bonsor. It's funny watching little kids follow the puck like an angry mob. We needed something fast, cheap and for the kiddies. Honestly, I haven't been here for over 18 years. You heard me right, it's been almost 2 decades! Another reason we came here was that Kim (I'm Only Here for the Food!) suggested that we all go there. I guess I spoiled that! 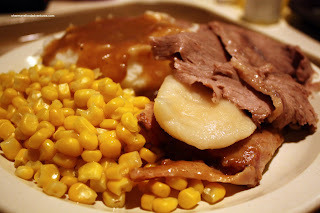 Finally, from my post on Old Country Buffet, I had slagged Uncle Willy's (to my cousin's chagrin) and felt the need to go there myself to form a fair judgment. Boy, lemme tell you, when we walked in, it sure looked like we entered a time warp from 18 years ago. However, I neither felt 18 years younger and with kids-in-tow, reminded us of our real age. While we were eating, I remarked to Viv that we had never eaten here together until now. That's a good thing, I'm not sure that Viv would've appreciated me taking her to a buffet for a date. Mind you, she ate 4 dozen wings before, so I guess it wouldn't have been that much of stretch. Bellingham is bigger and better for the same price as Uncle Willy's. But there is nothing remotely similar to Uncle Willy's here in the GVRD. Well, it could be that the demand for such a place is just not there anymore. However, if you wanted to merely stuff your face (with this type of food) for a nominal price, there really isn't much competition. 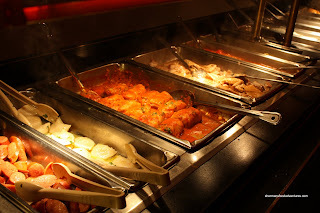 What comes to mind when you think of fried chicken in the GVRD? KFC? If you enjoy overcooked and salty chicken. Church's? If you enjoy chicken that only tastes like salt (although I don't mind it). Chicken World? Bleck! Primetime? Let's not go there... Of course there are finer dining establishments with their own rendition of fried chicken; but it's really not all that cheap. What to do if you want fried chicken that is not any of the above? Well, we did have Popeye's until it closed down. Same with Lee's Chicken. How about LA Chicken? No, it's not a French restaurant specializing in Coq au Vin; rather it's LA as in the city. From the outside, it looks kinda sad. On the inside, it looks even sadder. How can a place that looks so crappy and run by minimal staff have good chicken? Well, think of their chicken as taking the best parts of the other places. Also, if it tastes similar to Lee's, it's because LA Chicken used to be Lee's. 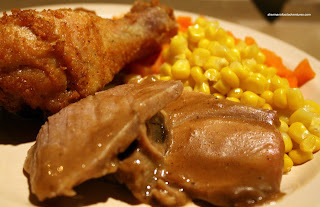 The chicken is tender and juicy, much like Church's; yet the meat doesn't taste like it's been brined to death. The skin is a better version of KFC where it is more peppery than salty. It's also very crispy, not like KFC's "kept in the warmer until it's soggy" skin. Another bonus is that the chicken actually has meat on it. It makes KFC look like they're serving Cornish game hens. The fries are your typical frozen variety; but at least they are fried up quite crispy and not oily. 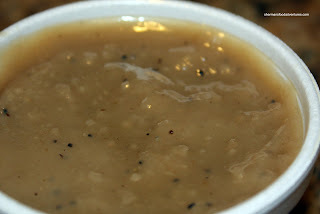 The accompanying gravy looks more like mud with ants in it; yet, don't let looks deceive you. It is actually quite tasty, again, being quite peppery. 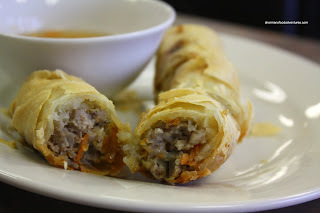 Great for dipping the crispy fries and chicken meat into. Of course anyone from down South would laugh at our selection of fried chicken; but LA Chicken is probably the best of the bunch here in the GVRD. recently eaten at On Lok, Penny, Koko and Wonton Noodles which are essentially within the same block. Not sure if that was done consciously or not. Joining me for this early morning snack was Polka King, Milhouse and Lionel Hutz. We arrived to a relatively empty restaurant (yah go figure, at 1:30am). However, while we were there, a constant stream of business kept coming in. Don't people have to sleep? Wait, why am I up? Alright, the last time I've been to Wonton Noodles was around 12 years ago - no joke! It was right after a night of clubbing. Yes, it's been THAT long! Naturally, I have no memory whatsoever of this place, except for the hideous looking plastic awning/cover at the front of the restaurant. I wasn't really all that hungry and only went for the Wonton Soup. I ask for the exclusion of green onions and guess what it arrived with? Yup, green onions. I always wonder if servers or kitchen staff even give a crap about special requests. Anyways, the broth was quite rich and flavourful. I only hoped it wasn't because of MSG. Although the wontons were not really all that big; they were full of shrimp. Not the best wontons I've ever had; but for 2:00am in the morning, they were solid and better than On Lok and Penny. Polka King had the Shrimp & Scramble Eggs (Boss Woman's favourite, too bad she wasn't here!). It really didn't look all that good since the shrimp were paler than boiled chicken. However, it seemed to be cooked correctly and Polka King indicated that it tasted better than it looked. For some inexplicable reason, Lionel Hutz ordered the Buhdda's Feast which is essentially a plate of stir-fried veggies. Well, it was a plate of veggies that have been stir-fried... Moving on, Milhouse got the biggest meal, in the form of the Black Bean Beef Fried Noodles. He declared that only half would be eaten and the rest for lunch tomorrow. Naturally, he finished the whole darn thing. When we say fried, the noodles are indeed deep fried and then topped with a black bean sauce with beef, onions and peppers. The dish looked quite appetizing and Milhouse concurred by finishing it off. As Todd Bertuzzi once stated, "it is what it is", and Wonton Noodles is exactly that. Not somewhere I would visit regularly; but if it's 2:00am in the morning, it fits the bill.